Due to its focus on new construction, this theory is narrowly limited in policy prescriptions to less than 1 percent of the total housing stock. To put this in perspective, California has a built stock of 13 million housing units, of which 6 million are rentals. Roughly 41 percent of owners with a mortgage and 57 percent of renters in the state cannot afford to meet their housing costs. The supply-side perspective assumes that any rent or price controls on 99 percent of the housing stock will impact the production of the 1 percent. The supply-side perspective conflates different housing markets and diverse clientele into one uniform package of building permits. The basic rule taught in Real Estate 101 is being violated by these sweeping theories of a uniform housing market in California, when the reality is that each metro has its own market and submarkets, and product types segmented by their unique customer-class (for example, McMansions, luxury condos, single-family detached, luxury apartments, hotel apartments, single-room occupancy housing, senior living, etc.) Each market has its own sensitivity to price changes, and the demand within each segment also differs. To illustrate, a luxury condo purchased as a second-home by a millionaire in San Francisco makes no difference to a middle-income renter in Fresno; and the relative impact of a 10 percent increase in housing costs for each is not comparable. The supply-siders assume builders will respond to the demand in an egalitarian manner. They don’t. Builders respond to profits, and the reluctance of the building industry to build entry-level homes reflects a fundamental flaw in the “let them eat cake” argument that the increased supply of luxury goods will somehow make staple goods more affordable. As we emerged from the recession, cities started focusing on infill, higher density development, but it is precisely this type of housing in these locations that is more expensive to build. The cost of construction increases as much as fivefold from low-rise wooden frame to high-rise steel and concrete. Residential land values in coastal California are over seven times the average in the U.S. And the site constraints are compounded with little room to adjust the building envelope. This is why permit processing in urban areas is under the microscope. The rationale for streamlining is that public input creates uncertainty for the developer and thus results in expensive delays, modifications, or rejections. Some of the rationale is justified, especially for smaller projects that cannot afford the time and cost of permitting. But the regulatory hurdles are a bogeyman for the housing crunch. For example, in downtown San Diego, there is virtually no NIMBYism, and development permitting is mostly by right. Yet a majority of residential market-rate developers chose to utilize a significantly lesser share of their entitled floor area ratios and pay inclusionary fees in lieu of providing restricted units on-site, leaving the state-mandated density bonus on the table. In other words, private developers are building fewer units than the zoning allows, and avoiding building affordable housing altogether, despite a tower of regulatory incentives being offered to them. Building affordable housing is simply not profitable. This results in wasted land capacity in transit-accessible areas. Table 1: Lopez, Russell (2014) “Urban Sprawl in the United States: 1970-2010,” Cities and the Environment (CATE): Vol. 7: Iss. 1, Article 7. 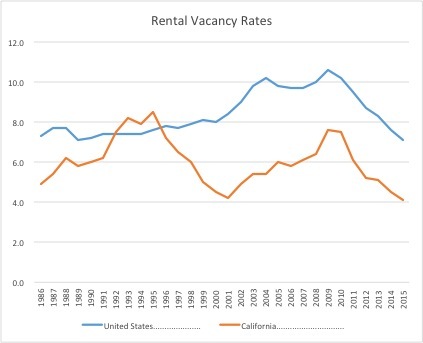 California needs to build enough housing to at least keep pace with its growing population. The underlying issue in the lagging supply is finance. The private sector is only building what makes Wall Street happy, however erratic that may be, and fails to address the burgeoning needs of the vast majority of middle-and low-income households. And the public sector supply does not have adequate financial tools to balance out the supply and keep building, even when lenders are nervous. A permanent source to fund affordable housing adequately must be created, so that sufficient housing units are either acquired or built to serve those with the greatest need, and the construction of affordable housing is buffered in the long-run from the boom-and-bust of economic cycles. It is time for a statewide requirement for affordable housing in all large residential projects. A state mandated program will produce more affordable housing units than a hodge-podge of voluntary local ones, eliminate “municipal tinkering” that research shows weakens its effect, discourage developers from “shopping around” for loopholes, and despite claims to the contrary, does not raise housing costs. To meet this mandate, compensatory benefits for developers, such as design flexibility and fast-track processing will encourage innovation and increase affordable housing production. Many good points. Affordable housing IS about “income” and “costs.” Shifting the property tax off of privately-created building values and onto publicly-created land values can accomplish important goals regarding both. A lower tax applied to building values makes buildings cheaper to construct, improve and maintain. Surprisingly, a higher tax on land values helps keep land prices more affordable by reducing the profit from land speculation – a parasitic activity that inflates land prices and creates sprawl. And, when land prices and building costs are reduced, there is more building activity that increases employment and incomes. As an added benefit, this tax reform incentivizes development of high-value parcels — and these tend to be infill sites near urban infrastructure amenities like transit. My problem with central planning, like all centralized government ideas, is that the central Planners do not move at the pace of the changing dynamics of the economy. Try to change zoning and general plan designations, and by the time you have completed all of the environmental studies, traffic studies and on and on, most developers throw up their hands. Right now there are numerous empty warehouses and industrial land in the Bay Area, however existing tenants in lower density affordable apartments are being evicted so that the apartments can be torn down to build higher density, newer, more expensive ones. Why not require zoning to be changed more easily, with two year plans, not 5-8 year plans, that allow developers to propose adjustment in zoning, without all the individual studies etc. Make it easier, and the market forces will work. Second, look at water and sewer, why do the coastal areas not utilize desalinization to create more water? Grey water systems should be mandatory for all new buildings. The government is too involved in California. This is wrong, “[trickle down theory of housing] depends on upward mobility in the middle class.” I call it “trickle up.” The “theory” actually depends on high income people preferring to rent in locations that are close to work and amenities. If a new, $2000/ mo apartment exists there, then they will rent it. If not, they will still spend $2000/ month, but they will live in an older unit farther from work or amenities. There is no assumption there about incomes rising. The author takes a strange argumentative turn where he actually grants that supply does bring housing costs down, and notices that the easiest, fastest way to add supply is to build sprawl and then argues that sprawl is bad. He’s right on both counts, but he glides over why it’s so easy to add sprawl, and so hard to add infill housing. It’s hard to add infill housing because people like him are writing articles like these opposing adding infill housing! It’s time for a revolution. I’m willing to die to keep a roof over my head. Someone please tell me in language that a child can understand: How can I be born onto land and not have access to it to live on it? Why have we turned shelter into a profit driven business? We need a revolution in how we think about land and who gets to profit it from it. But the masses should no longer be starving and foregoing a decent life in order to pay Wall Street and those that are just collecting their Real Estate Investment Dividend check on the backs of all of us scraping by to pay rent to them. It’s SICK and TWISTED and WRONG. And people fight and die for their country….I’m willing to fight and die to be able to have a very small patch of the earth to lay down my head at night and a place to cook my food. Is this really too much to ask? This article talks about a simple technique that allows naturally-created and publicly-created land values to belong to the public — while still providing people with security of tenure. UTTER BS… most of the run-down houses in the Bay area are 60 years old and still sell for 600k. Doesn’t matter if they build a starter home or not, the property value is worth too much to put a cheap home on.